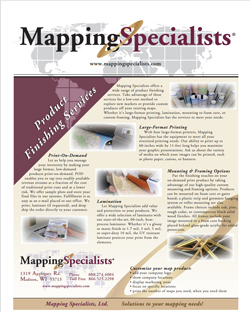 With a variety of small- and large-format color printers, Mapping Specialists can meet your printing needs. Our ability to print up to 60 inches wide helps you maximize your graphic presentations. Ask about the variety of media upon which your images can be printed. © Copyright Mapping Specialists 2019. Website by iCandy Graphics & Web Design.